This week, OUKITEL announced the first MediaTek MT6763 smartphone OUKITEL K6. 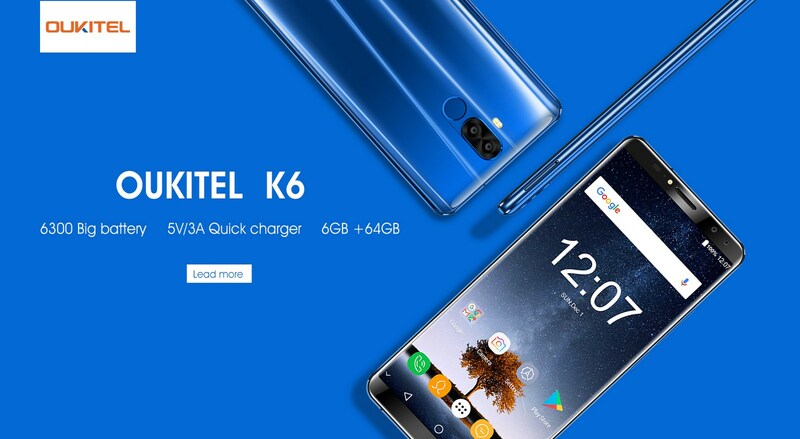 As OUKITEL said they are devoted to make this new phone the next killer for Christmas, we can expect that K6 will start global presale before Christmas. Here we have got more information for this stunning 6GB RAM smartphone K6. As it was leaked, K6 features a 6 inch FHD+ display with 18:9 aspect ratio. With larger usable area,handing experience will be more exciting. To be a “K”brother, K6 will pack a 6300mAh large battery for supporting up to 3 days use by one time charge with the 5V/3A quick charger. OUKITEL choose BAK brand high density battery for this powerful smartphone, together with Android 7.1 OS and intelligent power consumption management software, K6 offers long-lasting battery. Even if you use it from the time you get up until you get off work in the afternoon, K6 will not go out of power. See the video below about the power consumption test comparing to iPhone X. All the tests are taken under same wifi, brightest screen, and maximum volume. It is testing by playing online music, wechat voice call, video recording and downloaded 1080p hollywood film. iPhone X gets 2716mAh battery and by continuous power consuming, it turns off automatically after 5 hours 16 minutes. At this time OUKITEL K6 still has 65% left. This is indicating that a new powerful long lasting battery killer is born!